Lissy Lovett kicks off her week of editing Mostly Film with a post about her day job, theatre captioning. This week I’m on holiday from work and I’m guest-editing Mostly Film. This is largely a coincidence; editing Mostly Film isn’t a full time job even with all the swanky media parties, free cinema tickets and international acclaim. But when I’m not editing Mostly Film I work for STAGETEXT, who caption and subtitle art and entertainment. Age-related hearing loss is going to come to all of us, sooner or later, as long as we’re lucky enough to live that long. My fellow writers on this site like a lot of different kinds of entertainment, mostly films as is suggested by the title, but I personally like going to the theatre. And when I become hard of hearing then I am going to thank my lucky stars that I live in London, not only one of the leading theatre-making cities in the world, but also the most accessible. 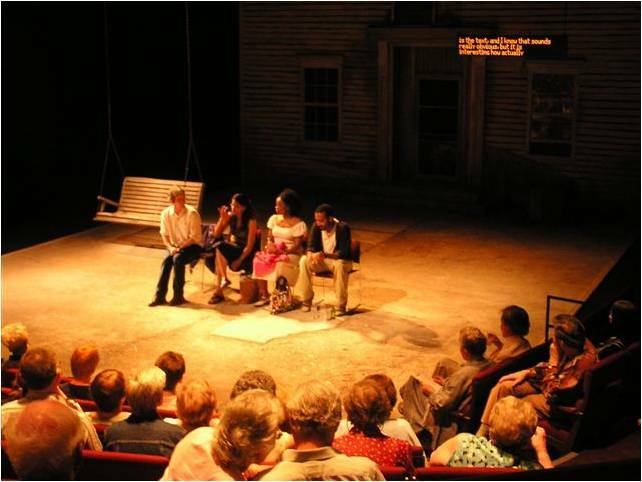 In theatre captioning, the words of a play or musical are prepared ahead of time and then cued out live by a trained captioner on a display ideally on or near the set. In much the same way that if you really notice a waiter they’re probably not doing a very good job, top quality captions which have been formatted right and are well timed will look almost effortless, which is very unfair on the captioners who slave away night after night alone in darkened theatres marking up the official script with all the pauses, phrasing changes and paraphrases of a specific cast. Although there are some superficial similarities to opera surtitles, theatre captions are generally verbatim, contain a lot more information – like character names and sound effects – and are tailored to the needs of deaf, deafened and hard of hearing audiences, though plenty of other people find them useful too. Most of the big West End shows, nearly all the bigger producing theatres, and even some really tiny theatres like the New Diorama Theatre, offer captioned shows. Some of that captioning is done by us at STAGETEXT, and some by the theatres themselves. In the case of a long-running West End musical there might be one or two captioned performances a year, which as anyone might tell you doesn’t sound like nearly enough. Imagine waiting 11 months for the one night you could go to the theatre and properly understand it, only to get a cold that particular evening or get invited to an ill-timed wedding. Here’s the thing though: despite there not being nearly enough of it, in the UK we have more captioned theatre than anywhere else on the planet. Theatre captioning started in the USA, and they still do a lot, particularly on Broadway through the great people at the Theatre Development Fund, but per capita I don’t think it’s anywhere near as much as us. Captioned performances can also be found in Ireland, Australia and even in Finland at the Swedish-speaking theatre in Helsinki, and no doubt many other places too. In fact, if you know of an international theatre doing captioning then do let me know, I’m always keen to find out about more. Why is that the UK theatre industry found out about captioning, and took to it in quite the way that they have? Partly I think it’s due to the indefatigable advocacy of many caption-users, partly it’s because it was adopted by a big theatre company, the RSC, right at the outset, but mostly I think it’s because there’s a thread of inclusivity running through UK culture, and the arts scene, which we’re so used to we don’t even notice it’s there. Although the Culture Secretary, Sajid Javid, made some headlines recently when he said that the arts didn’t do enough to make themselves accessible, I don’t think that theatre being for everyone is anything new at all. From the low priced standing tickets for the Elizabethan theatres, via Joan Littlewood and the commune-like Theatre Workshop right up to the work the Lyric in Hammersmith does with young people, theatre has more often than not been for the many and not the few. You’d be hard-pressed to find someone working in theatre in the UK today who isn’t thrilled by the thought of someone discovering or rediscovering theatre for the first time and who actively wants theatre or the arts to be elitist. They will seize any opportunity to grow audiences, not just for increased ticket, programme and gin and tonic sales, but also through a genuine wish for everyone to enjoy the arts. Captioning, and caption-using audiences, are just one aspect of an ongoing drive to diversify audiences. This welcome doesn’t just extend to hard of hearing and deaf audience members. There is also audio-description for blind and partially sighted audiences and British Sign Language interpretation for the smaller section of Deaf people who use sign language and prefer to access theatre this way. The latest addition to the range of accessible performances are relaxed or autism-friendly performances where audiences know that they’ll be free to make noise or to come and go without being shushed. The interesting thing to me here is that there are a few people asking why we even need to have special relaxed performances, wouldn’t it be better if all performances were that relaxed with just the occasional quiet performance, like a quiet carriage, for anyone who really can’t bear acknowledging the presence of other audience members. A great deal of British theatre happens to happen in London, which is a bit of a pig sometimes if you live somewhere else, particularly if you’re hard of hearing. I’m not sure that the London-bias of the arts world or UK culture in general is about to change overnight, but in the meantime Digital Theatre are just about to release captioned versions of some of their live theatre recordings, so very soon almost anyone hard of hearing on the planet will have access to good quality British Theatre, and that’s going to be another excellent option for future-me too. This post is a celebration of British theatre in general, and captioned performances in particular. Yes, there aren’t enough captioned shows, and yes, too many of them happen in London, but we’re still doing really well and it’s all only going to get better. Many more live and screened events will have subtitles in years to come, enabling the arts to reach many more people. And if you know someone who always has the TV up a bit too loud or likes to have the subtitles on, why don’t you let them know about theatre captioning? There’s a whole world of British theatre out there for them. Lissy Lovett doesn’t watch many films and tweets here.